Ever considered becoming an Eye Clinic Liaison Officer? Geoff Pickance, an ECLO based at The Link Office, Queen's Medical Centre, Nottingham, provides an insight into this important and varied role. In 1979, in my early 20s, I was suddenly diagnosed with glaucoma. Major loss of vision, no idea where to turn to, or what to do – how was I to cope when life was turned upside down? So I embarked upon a road of self-help and discovery – via RNIB Manor House on the way. I was positive and determined. I have been the ECLO at the Queen’s Medical Centre for 12 years – and it is the same hospital where I have been a patient for more than 30 years. Everything and anything. More than 1,000 patients a year are in contact with the Link Office. People can call in for a discussion about their situation and needs, and direct referrals can be made to various organisations, such as Social Services, DWP, Blind Veterans UK and so on. I can meet patients in the clinic to discuss their medical condition, arrange appointments, replace magnifiers and much more. My direct phone number is also given out. All completed certificates of vision impairment (CVIs) come to me – I contact all Nottinghamshire patients on the day that I receive the CVI. I am part of the local authorities that fund my job, and I complete the initial contact assessments – then deal with registrations, travel passes and other concessions at this time, so avoiding any delays. 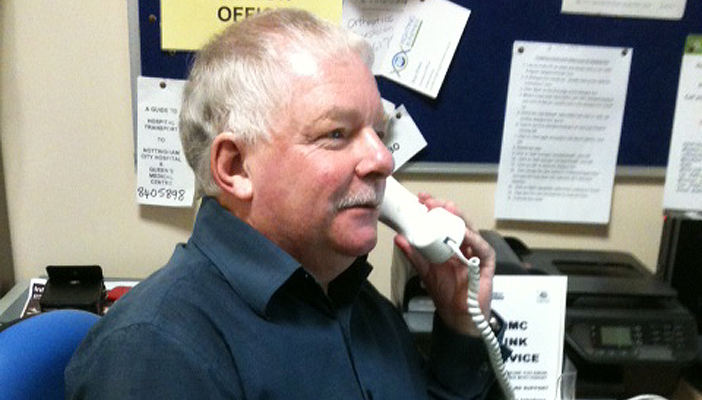 I visit patients on the hospital wards to provide information and liaise with medical staff. I link with hospital and rehab workers to try to help procedures run as smoothly as possible. I visit groups, such as occupational therapists, to give talks and information about the role of the Link, and how important it is that patients are pointed in the right direction. I also research information and ensure it is relayed around the clinics, and wider afield. People becoming more positive about their futures, with a smile returning to their faces, and taking control of what they want to do. People, not just patients, not realising that quality of life can improve, given the right encouragement, frame of mind and support. It can also be difficult to find services and organisations that change their contact details – with no apparent benefit. Absolutely. It is vital that people are given the chance to live their lives to the full – the psychological effect of trying to live with poor vision is immense. A positive outlook/rehab input may prevent falls, keep families together, and encourage employment and training, etc. A lady in her 80s came to see me. Her life revolved around e-mails to keep in contact with family around the world. She had a small hand magnifier that she used to see items on the screen, but could not find the mouse, and was frustrated and miserable. I use computer magnification myself in the Link, so I was able to demonstrate it to her. She could read the screen clearly, with x6 magnification. “Ah,” she said, “but you have a special computer.” So I said that such magnification could be installed on her computer, and I gave her the information. She stood up, smiled and punched the air with her fist. “Yeah,” she said, “brilliant.” Then she toddled off. No other job would be comparable – maybe apart from Prime Minister. I would then have the power to ensure that the role of the ECLO is expanded throughout the land. Absolutely, especially if you are living with sight problems yourself. Commitment – to spread the word that hope, confidence and ability can be built up, making life worth living. Remember that each person is an individual, and needs and hopes will vary accordingly. It may be pure chance that people find the right road to take. That chance needs to be given. Trust and reliability – people can call my direct phone number at any time. Ensure that people are dealt with promptly and confidentially. Listen to patients; it is their lives. Flexibility – wherever and whenever the need is. The ECLO needs flexible thinking as well to come up with ideas and solutions. If there’s a will, there’s a way!